The Indira Gandhi Container Terminal (ICT) in Mumbai officially opened up for Ro/Ro operations on 18th July 2015. On 20th July, Höegh Seoul made the inaugural port call. Sea and ships are always interesting. There are various types of ships:-Roll-on/roll-off (ro-ro) ships are vessels designed to carry wheeled cargo, such as automobiles, trucks, semi-trailer trucks,trailers, and railroad cars, that are driven on and off the ship on their own wheels or using a platform vehicle, such as a self-propelled modular transporter. There exists another specialised category - Pure car and truck carriers (PCTCs), designed to accommodate vehicles, from completed passenger cars to construction machinery. Dwarfing surrounding buildings, passing boats and even Tynemouth Priory, the world’s biggest car carrier arrives on the Tyne. It is vessel ‘Hoegh Target’ on her maiden voyage from China.The vessel has a deck space of 71,400 square meters and can carry 8,500 cars.Besides Hoegh Target’s enormity, another special feature is its exceptionally high cargo doors, higher than any other fleet Hoegh Autoliners has ever set sail, with 6.5 m in height and 12 m in width. Such dimensions enable shipment and loading of larger products that was not previously feasible. It is also equipped with strengthened extra ramps that can transport an amazing cargo load of 375 tons. Höegh Autoliners is a leading global provider of Ro/Ro transportation services. The company operates 15 trade routes in global trade systems alone or in partnerships, with about 3,000 port calls annually, according to its website. Höegh's shipowning history goes back to 1927 when it was founded by Mr Leif Høegh. In 1960s, the company diversified to transporting cars. In 1987, Leif Höegh& Co ASA was listed on the Oslo Stock Exchange after merging the various shipowning entities. In 2008, HöeghAutoliners relocated its ship owning activities from Bermuda to Norway. The same year the company acquired a fleet of 12 car carriers from A.P. Moller – Maersk. 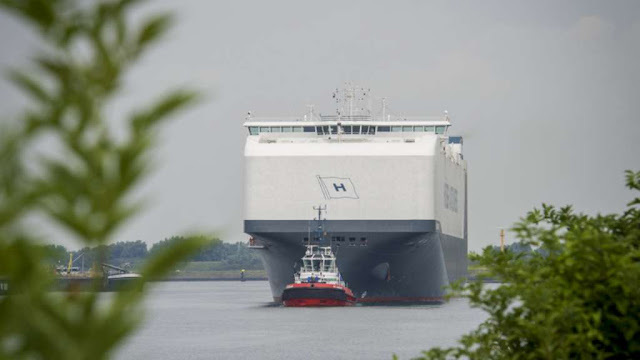 Höegh Target is the first in a series of six Post Panamax vessels under the New Horizon design that HöeghAutoliners will take delivery of in the next 18 months. With its deck space of 71 400 square meters and carrying capacity of 8 500 car equivalent units, the vessel is the world’s largest Pure Car and Truck Carrier (PCTC). Mrs Mette Folden, wife of Ingar Skiaker, CEO Höegh Autoliners, named the vessel “Höegh Target” through the traditional ceremony. It is claimed that extensive model testing have been carried out to achieve outstanding performance. In addition to calm water performance, special focus has been paid on added resistance in heavy seas and wind resistance.